Today, the United States and Israel are the closest of friends and allies. The continued strength of the U.S.-Israel alliance is rooted in the shared values of the two nations. During more than six decades of state-building, Israelis have looked to the United States for political inspiration, financial and military assistance and diplomatic support. Americans, in turn, have viewed Israel with a special appreciation for its successful effort to follow the Western democratic tradition, its remarkable economic development, and its determined struggle against its uncompromising enemies. The mutual admiration between Israel and the United States is hardly a recent phenomenon. I will insist that the Hebrews have done more to civilize man than any other nation. Recalling the previous experiences of the colonists in applying the Mosaic Code to the order of their internal life, it is not to be wondered at that the various passages in the Bible that serve to undermine royal authority, stripping the Crown of its cloak of divinity, held up before the pioneer Americans the Hebrew Commonwealth as a model government. In the spirit and essence of our Constitution, the influence of the Hebrew Commonwealth was paramount in that it was not only the highest authority for the principle, "that rebellion to tyrants is obedience to God," but also because it was in itself a divine precedent for a pure democracy, as distinguished from monarchy, aristocracy or any other form of government. And Proclaim Freedom Throughout The Land Unto All the Inhabitants Thereof (Leviticus 25:10). Although it took some 2,000 years to resurrect Hebrew as a spoken language in early twentieth century Palestine, Hebrew was actually a prerequisite for early American scholars. Many universities even required it in their curriculum. Hebrew was compulsory at Harvard until 1787 and, to this day, Yale's insignia bears the Hebrew phrase, Urim V'Thummim (oracle learning). American support for the age-old aspirations of the Jewish people to return to their homeland dates from the Colonial period when John Adams wrote: "I really wish the Jews again in Judea an independent nation for, as I believe, the most enlightened men of it have participated in the amelioration of the philosophy of the age." John Quincy Adams wrote to Major Mordecai Manuel Noah that he believed in the "rebuilding of Judea as an independent nation." Not long after the Emancipation Proclamation, President Abraham Lincoln met a Canadian Christian Zionist, Henry Wentworth Monk, who expressed hope that Jews who were suffering oppression in Russia and Turkey be emancipated "by restoring them to their national home in Palestine." Lincoln said this was "a noble dream and one shared by many Americans." The President said his chiropodist was a Jew who "has so many times ‘put me upon my feet’ that I would have no objection to giving his countrymen ‘a leg up.’"
In 1883, Emma Lazarus, the poet whose words are inscribed on the Statue of Liberty, wrote that Palestine should be as "a Home for the Homeless, a Goal for the Wanderer and an Asylum for the persecuted and a nation of the denationalized." In 1891, pogroms incited by Czar Alexander III provoked an outcry by many prominent Americans, including the Chief Justice of the Supreme Court and Speaker of the House. Rev. William E. Blackstone and Cardinal Gibbons presented a petition signed by those who were concerned about the fate of the Jews in Russia to President Benjamin Harrison and Secretary of State James Blaine. They called for the first international conference "to consider the Israelite claim to Palestine as their ancient home, and to promote in any other just and proper way the alleviation of their suffering condition." Why not give Palestine back to the Jews again? According to God’s distribution of nations, it is their home—an inalienable possession from which they were expelled by force. Under their cultivation was a remarkable fruitful land, sustaining millions of Israelites, who industrially tilled its hillsides and valleys. They were agriculturists and producers...the center of civilization and religion. We believe this is an appropriate time for all nations, and especially the Christian nations of Europe, to show kindness to Israel...let us now restore to them the land of which they were so cruelly despoiled by our Roman ancestors. The signatories’ idea preceded the first World Zionist Congress that adopted the program to establish a Jewish homeland in Palestine by six years. After Wilson left office, his successors expressed similar support for the Zionist enterprise. "It is impossible for one who has studied at all the services of the Hebrew people to avoid the faith that they will one day be restored to their historic national home and there enter on a new and yet greater phase of their contribution to the advance of humanity," said President Warren Harding. Calvin Coolidge expressed his "sympathy with the deep and intense longing which finds such fine expression in the Jewish National Homeland in Palestine." "Palestine which, desolate for centuries, is now renewing its youth and vitality through enthusiasm, hard work, and self-sacrifice of the Jewish pioneers who toil there in a spirit of peace and social justice," observed Herbert Hoover. The Jews of America are profoundly interested in establishing a National Home in the ancient land for their race. Indeed, this is the ideal of the Jewish people, everywhere, for, despite their dispersion, Palestine has been the object of their veneration since they were expelled by the Romans. For generations they have prayed for the return to Zion. During the past century this prayer has assumed practical form. Legislatures in 33 states, representing 85 percent of the population, also adopted resolutions favoring the creation of a Jewish state in Palestine. Governors of 37 states, 54 United States senators, and 250 congressmen signed petitions to the President. In early 1947, the British, who then administered a League of Nations mandate for Palestine, decided to bring the question of how to resolve the dispute between Arabs and Jews to the United Nations. The UN General Assembly decided to set up the United Nations Special Committee on Palestine (UNSCOP) to investigate the cause of the conflict in Palestine, and, if possible, devise a solution. UNSCOP, composed of representatives from 11 nations, visited Palestine and found the Jewish community very responsive to its inquiries. The Arabs in Palestine greeted UNSCOP with hostility and refused to cooperate. The Arab Higher Committee boycotted the Commission but demanded that the UN immediately grant Palestine its independence. The majority of the UNSCOP representatives concluded that the question of ownership or right to Palestine was an insoluble antinomy. Rather than try to solve it, they chose the logical alternative of partition, in which both Jews and Arabs would be given sovereignty in their own separate state. The United States endorsed the majority report and called on the General Assembly to approve partition. 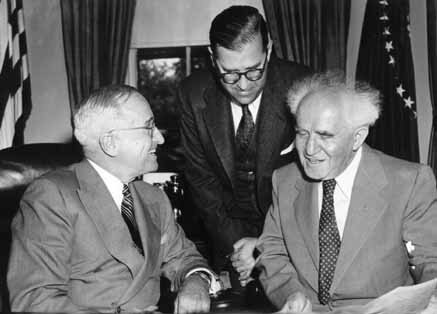 Some dispute exists among scholars as to how vigorously the Truman Administration lobbied for the resolution. Nevertheless, ample evidence exists to indicate that U.S. influence played a critical role in securing the adoption of the partition resolution. Less than six months later, Israel declared its independence and the United States was the first nation to grant de facto recognition to the new Jewish State—11 minutes after the proclamation. The recognition of shared values has been a consistent theme in statements by American Presidents ever since Truman. The roots of Johnson’s feelings, like those of many other Americans came from the Bible. Barack Obama stated that “we [America] stand with Israel as a Jewish democratic state because we know that Israel is born of firmly held values that we, as Americans, share: a culture committed to justice, a land that welcomes the weary, a people devoted to tikkun olam.” Furthermore, “We’re going to keep standing with our Israeli friends and allies,” he said. The Jewish population in the United States is less than six million; therefore, the political activity of Jews who view strengthening U.S.-Israel relations to be in the national interest alone cannot explain the depth of the friendship that exists. Fewer than 2 percent of the population could hardly have such a dramatic influence on American foreign policy. The U.S.-Israel alliance is rooted in shared values.